Oftentimes, Saturday lunch around here starts with Friday night leftovers. This weekend, those leftovers happened to be some pretty fantastic sous vide ribeye steak. Steak doesn’t reheat very well, but it’s delicious sliced thinly and served as is, cold from the fridge. When I was a kid I used to snack on it straight up, or with a smear of dijon mustard on top. Today’s salad takes that idea just a little bit further. 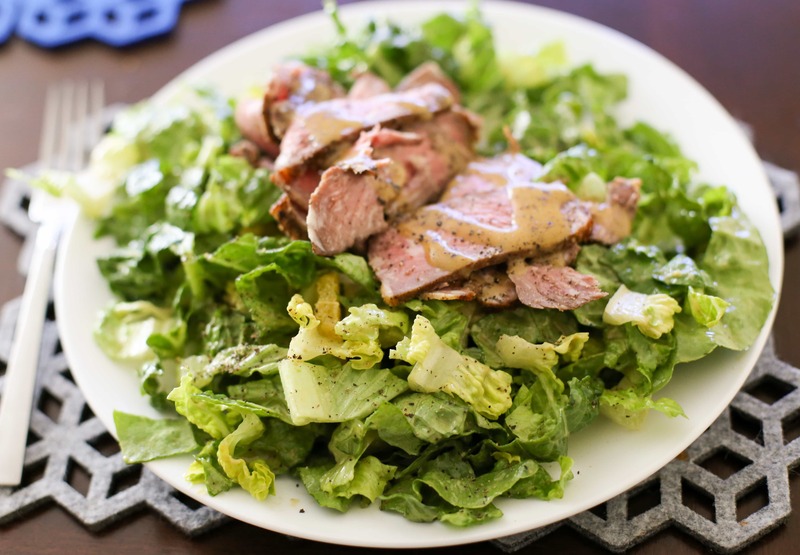 Sliced steak tops a salad of romaine lettuce tossed with two of my winter favorites: avocado and orange. Everything is tossed in a citrusy, dijon-spiked vinaigrette, with a little more drizzled on top for good measure. Meyer lemons are in profusion this time of year in California, so I tend to use them in just about everything. I love how they lighten up a basic balsamic vinaigrette. I use an immersion blender to make the vinaigrette emulsify and get extra creamy, but you can whisk or shake it in a tightly-lidded container if you don’t have one on hand. This salad is substantial, yet full of bright citrus flavor. Combine all of the vinaigrette ingredients in a wide-mouthed, pint-sized mason jar or other similarly sized container. Use an immersion blender to emulsify the dressing until it turns creamy and lightened in color, and all of the olive oil is incorporated. In a large salad bowl, toss the lettuce, oranges and avocado with most of the vinaigrette, reserving a couple tablespoons. 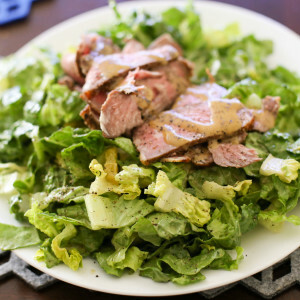 Plate the salad, layer the slices of steak over the top, and drizzle the steak with the remaining vinaigrette. Grind some black pepper on top and serve. Hi, you have a recipe for mustard salad dressing,I seem to have lost it.